Get rid of the cubicle lifestyle for a week and travel to an amazing eastern country at the end of this fall with the New York to Kuala Lumpur flight for $892 r/t with taxes and fees. 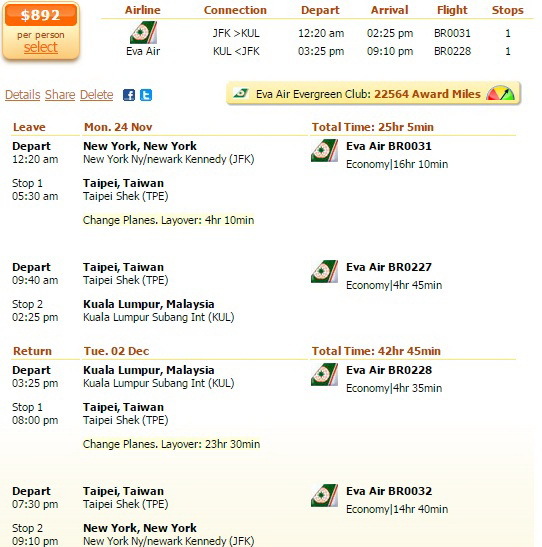 Fly in late November with Eva Air and you can save at least $42 compared to all other airline companies we have seen. We have found this FlightHub deal on Travelgrove, but that does not mean that you should not check some other providers as well to compare their prices and maybe find a cheaper Kuala Lumpur flight. You will start your trip to Malaysia from John F Kennedy International Aiport (JFK) on November 24 and return on December 2 from Kuala Lumpur International Airport (KUL). You will have a 4 hour 10 minutes stop in Taipei on the way to Malaysia and a 23 hour 30 minutes one on the way back. Eva Air Evergreen Club will reward you with 22,564 award miles for booking this airfare. While the Eva Air flight costs only $892 r/t, the next cheapest fare – a China Southern Airlines flight – is $42 more expensive, exactly $934 r/t. Check all the deals below. This entry was posted on Saturday, November 8th, 2014 at 2:49 am and is filed under Airfare Deals. You can follow any responses to this entry through the RSS 2.0 feed. You can leave a response, or trackback from your own site.